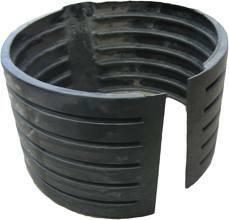 Foster Supply provides their customers with a large variety of belled corrugated HDPE pipe diameters with gaskets plus all the fittings and connectors that go with them. We stock sizes anywhere from 4” to 48” with larger sizes available upon request. Large quantities of pipe are delivered quickly to projects due to the large inventories that are maintained . Pipe can be nested or direct shipped on larger projects to save even more on shipping costs. If you have any other questions just give us a call and we will help you in any way we can.